The benchmarks left by James Clark Ross on the cliffs of Port Louis will facilitate future studies of sea-level change – just as Ross intended. Sea levels around the Falkland Islands in the South Atlantic have risen since the mid nineteenth century and the rate of sea-level rise has accelerated over recent decades, according to newly published research. The findings are as expected under global warming and consistent with observations elsewhere around the globe. “We have been fortunate in being able to compare modern sea-level measurements obtained from tide gauges and from satellite radar altimeters with historical measurements made at Port Louis in the Falkland Islands in 1842,” explained researcher Prof. Philip Woodworth of the National Oceanography Centre. 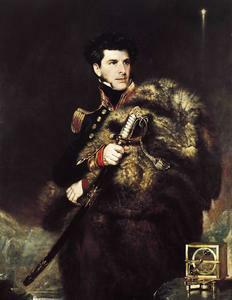 In 1839, distinguished naval officer and polar explorer James Clark Ross (1800–1862) set off on an expedition to the Southern Ocean with two ships, HMS Erebus and HMS Terror. In April 1842, he stopped at Port Louis, primarily to make magnetic field and other measurements, but also to make repairs to his ships which had been badly damaged in the Drake Passage. Having set up a winter base, he took the opportunity to make careful measurements of sea level relative to two benchmarks cut into the cliffs and marked with brass plaques. These marks remain in good condition to this day. This fact, along with the apparent good quality of Ross’s data, has allowed Woodworth’s team to compare the sea level records from 1842 with measurements taken at Port Louis using modern instruments in 1981–1982, 1984 and 2009. They also used information from nearby Port Stanley, where a permanent tide gauge was operated in the 1960s and 1970s and where NOC has had an operational gauge since 1992. After correction for air pressure effects and vertical land movement due to geological processes, the researchers find that sea levels rose by an average of around 0.75 millimetres a year between 1842 and the early 1980s. They point out that this figure is similar to previous estimates for the long-term rate of sea-level rise at Port Arthur in Tasmania, measurements with which Ross was also associated, and at other locations in the Northern and Southern Hemispheres. However, they also find evidence that the rate of sea-level rise has accelerated over recent decades. Specifically, they estimate that sea levels around the Falkland Islands have risen by an average of around 2.5 millimetres a year since 1992, a figure consistent with measurements made by satellite radar altimeters over the same period. Longer-term data from the Falklands, and from many other locations, are needed to establish whether the apparent acceleration in sea-level rise is due to increased global warming, or the result of some kind of decadal fluctuation. “The benchmarks left by James Clark Ross on the cliffs of Port Louis will facilitate future studies of sea-level change – just as Ross intended,” said Woodworth. The researchers are Philip Woodworth and David Pugh (National Oceanography Centre), and Richard Bingley (Institute of Engineering Surveying and Space Geodesy, University of Nottingham). This work was funded by the UK Natural Environment Research Council and the Shackleton Fund.